When you sign Danny Cipriani you know you are going to get an awful lot of talent and that life will never be dull. Well for the next four or five weeks it looks like we are going to find out what this new Glaws side can do without the mercurial fly-half . His high tackle wasn't by an standard the worst you will see but his shoulder did connect with Rory Scannell's head and the Ref made his decision. The RFU will witter on about high-end and low-end but the pundits think it will be five weeks. Two might me more just. The dismissal undoubtedly affected the result. Things are tough enough against Munster without losing a major talent - and so it proved. 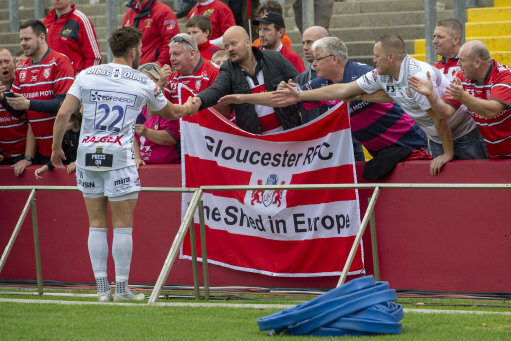 However, the remaining Glaws players can hold their heads up high and their efforts were appreciated by the travelling faithful. The 36-22 defeat was not a disaster. Mike Haley and Rhys Marshall gave the home side a first half lead but we managed three of our own from Gerbrandt Grobler, Jason Woodward and Ben Morgan when we were down to 14. Our pressure even reduced Munster to 13 men with two late yellow cards. They now top of Pool Two ahead of Castres who beat Exeter Chiefs.